She's certainly hit on the tribal look, but this tote isn't as chic as its name suggests. In fact, it seems like a bit of a mish-mash with animal printed appliqués, different colored metallic skins, and studs all thrown into the mix. I think Kathy Van Zeeland was aiming for edgy, but the look is so confused that it seems to lack that vision. That lack of vision extends to the interior. The dainty blue art deco printed fabric is pretty, but it's also befuddling. Leopard spots or tiger stripes I could have understood. Even basic black would have made sense. But this is just another element that doesn't seem to mesh. It's a shame, because when you strip away all the aesthetic problems this isn't a badly designed tote. It's got the right amount of space for daily use, and its array of zip and slip pockets are just what we need to stay organized. Add two handy slide pockets at the sides and a pair of long, useable handles, and we're ready to face the day. Well, almost. It'll take some careful planning to strike on the right outfit to team with this flamboyant tote. My advice is to go neutral and let this loud bag do all the talking! 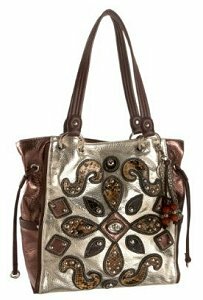 The Melie Bianco Applique hobo bag, a great alternative to this tribal bag.